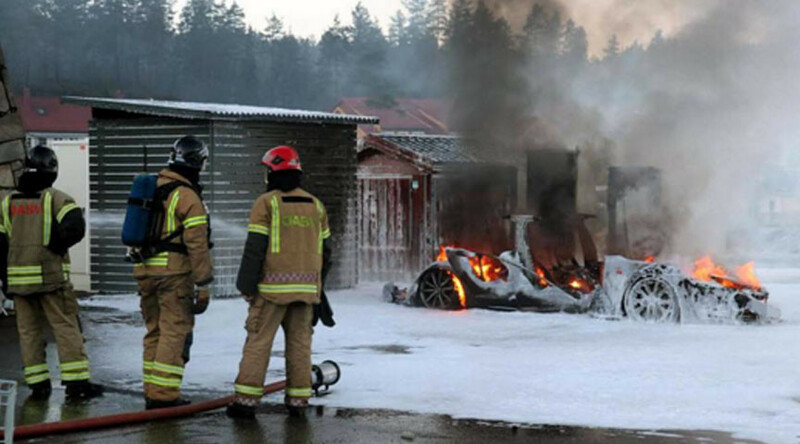 Yet another Tesla Model S has burst into flames, getting the new year of its Norwegian owner off to a bad start. The electric sedan caught fire while plugged into a SuperCharging station in Gjerstad, Norway. Emergency services were called, but by the time firefighters arrived, the car was completely ablaze. Nobody was injured in the incident, though it has added to a list of similar instances raising concern about the car’s lithium-ion battery. Tesla insisted before this incident that charging the vehicle was not a fire hazard and the US National Highway Traffic Safety Administration (NHTSA) awarded the car its highest safety rating of five stars in 2013. The company’s CEO, Elon Musk, lost nearly $600 million of his wealth after the first story surfaced about a Tesla bursting into flames outside Seattle in October 2013, according to the International Business Times. Three more fires taking place in Mexico City, Tennessee, and California, as well as at least six instances of overheating reported in 2013, prompted the company to send a software update and new charger adapters to its customers. That still didn’t prevent a 2014 incident when a man stole a Model S from a Tesla dealership in Los Angeles, led police on a high-speed chase, and eventually crashed into a telephone pole, splitting the car in half, and spitting its flaming batteries into the air like fireworks. Tesla continues to insist the car is safer than internal combustion engines, although neither the electric Nissan Leaf nor Chevrolet's gas-electric hybrid, Volt has suffered from the same issue.